Years ago I attended the funeral of Pastor Wendell Smith, the founder of City Church in Seattle and Pastor Judah Smith's father. It was such a great picture of someone who had really made their life count for something. In that moment, I was very much aware of my own mortality. What did I really want my life to stand for? For me, the big deal is that I leave a legacy that truly honors Jesus. So, here are some of the thoughts that I wrote down that day that I wanted to share with you on how to plant an eternal signature. PURPOSE: "To have a life mission." When you know where you're going, you know the roads that won't take you there. That's really what a life mission does. It helps steer us in the right direction. Truth is, until you know who you are, you're probably trying to be someone else. That's why I am a woman on a mission to be "Jesus with skin on" to a few people around me. PASSION: "A desire strong enough to shape your daily choices." I think we almost beat the passion out of ourselves by competing with kingdom champions and thinking we'll never be like them. We compare our youth ministry budgets, number count, and speaking abilities. Then we disqualify ourselves and begin to think that what we're doing really isn't making a difference. When you compare yourselves to others, the Enemy will immobilize you. But I don't think God is looking so much for champions as He is contenders. So don't worry about what everyone else is doing. The best way to live your life is to spend it on something that will outlive you. TRUSTWORTHINESS: "Other people learn they can have confidence in you." Trust is developed with TESTS and TIME. Effectiveness in life and in relationships is more of a slow cooking oven than it is microwave. So live with enough consistent character that people know that you can be trusted over the long-haul. If you change direction too much, the people who follow you will get whiplash. INTEGRITY: "Time and tests prove integrity." Without integrity, you become a BOSS, but not a LEADER. Ask yourself a simple but convicting question, "Is there a sense in your life that your actions and words are the same?" In order words, "Are you making your words whole with your actions?" It's easy to lack integrity in certain areas of our lives, so my prayer is, "Lord, free me of all the disconnected parts." DARING: "No success comes from playing it safe." It's not what you do that makes your work sacred, but why you do it. I love telling you that I've failed because it also tells you that I've tried. I think fear of failure leads to inaction. Get used to failure so that it doesn't immobilize you. Take some faith risks. That's my simple challenge. I say to myself often, ships look great in the harbor but that's not their purpose lived out. When you take that risk and plant that small seed, remind yourself that God already sees the forest! Thank you for being one of those amazing people that wants to spend their life for something that will ripple into eternity and for living your life in a way that makes Jesus smile. This year I was invited to a reunion of SPIRENO, a youth group that I led 25 years ago. It was a great time getting together with some of my old students, some of whom are now the grandparents of the current students in the youth group! We had a wonderful time reminiscing and some of the things they remembered really surprised me. Though most of you haven't been in youth ministry long enough to have a 25-year reunion, you might be interested in knowing just what they will remember...25 years from now. In this Youth Leader's Coach, I share the 5 things that my students tell me over and over again were defining memories in their life. Some of the things that I thought they would remember most, seemed to fade into the background. They made it clear that 25 years later, the things they remember weren't my "amazing messages" or "great events." But what they remember most was how Christ's life flowed out of me in the tiny ways to let them know that the love of Jesus Christ is more than a nice platitude, but a living, breathing reality. Are you going to spend your life trying to be great...or trying to make others great? One "ultimate question" casts the die for many of us. No, it's not "What would Jesus do? "...though granted, that's a pivotal question. But, it's a LEADERSHIP question that will shape your attitudes, priorities, goals, and everyday living. Here's the question: Are you going to spend the rest of your life trying to BE GREAT...or trying to MAKE OTHERS GREAT? If your answer to this question is the second option, then hell will deeply fear the eternal impact of both your life and your legacy. In this month's Youth Leader's Coach, I'm sharing some of my own personal thoughts on how to live "The Ultimate Question." I'm hitting four talking points that help us focus on MAKING OTHERS GREAT. This will be an outstanding resource for helping those around you reach higher ground. When I started in youth ministry, I had about 20 kids in the youth group. My idea of success? A night together in youth service where Jesus showed up, kids laughed together and prayed together, and maybe even a new kid or so excitedly decided to give their life to Christ. I mean, back in 1970, that was my idea of a mind-blowing YOUTH MINISTRY SUCCESS. It took only about three short months to start adding stuff to that original equation. Remember those 20 kids? Well, pretty soon, "real success" needed to include having about 30 kids show up! And somewhere through those opening, exciting months, something NEW to me was "born" in my life and head. It was small and almost a little "cuddly" at the beginning. Kind of like a friendly little "stuffed animal" from my past. But on closer examination, it wasn't that innocent and it sure wasn't that "cuddly." I had given birth to a small, not-too-scary-looking DRAGON. 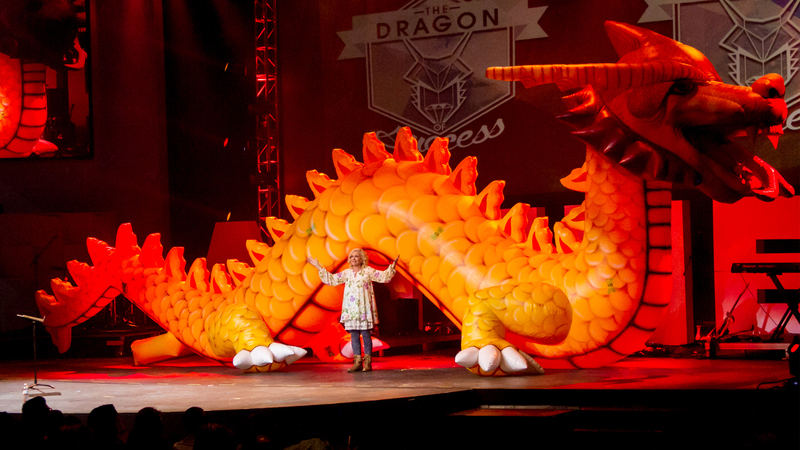 So my prayerful goal for this message is to remind all of us that the "DRAGON OF SUCCESS" is maybe one of the most ferocious enemies ANY of us will ever face in our own minds...but we'll ALL face him...whether we're the "lead person" on the team, an amazing volunteer assistant, or just a career-orientated person who's just trying to get ahead on the job-site. I'm LIVING, TRANSPARENT, VULNERABLE PROOF that THE DRAGON OF SUCCESS can hang around for a pretty long time. The point I'm trying to make is that probably all of us have VARIATIONS of this "Dragon" that Jesus and His love wants to slay – dragons that are fed by our insecurities, our fears, our needs for approval and acceptance. Creating Legacy...What you will be remembered by? Have you ever dared to think of who will remember you when you are gone? And even deeper, what you will be remembered by? Will you be remembered by your rock solid character? Or perhaps, will you will be remembered by what my hero and husband is being remembered by, his PRAYER LIFE. Or maybe that won't be your legacy. What if you are remembered for being selfish, unkind, maybe a gossip, a disinterested parent, or lazy youth leader? In this Source, "Where Are They Now?" we talk about the LEGACY we will choose to live out while on this earth. I talk about how we can do this STRATEGICALLY and INTENTIONALLY in the society we live in today. And how we can strive to do this consistently so that we can make a REAL, LASTING impact on the lives of this generation. What will be the signature of your life? I've always been a woman on a mission...to leave a genuine legacy that honors Christ. You've heard me quote my personal mission statement over and over: "The motivation and mentorship of Kamikaze Christianity into practicing and potential Kingdom champions." In this Source I challenge each of us with the question, "What's going to be the SIGNATURE OF YOUR LIFE?" I ask you to be audacious enough to answer the unspoken question that everybody will be trying to casually ask in the “reunion” celebrations of your life, "WHAT DID YOU DO WITH YOUR LIFE?" We all want to do something AMAZING and WORLD-CHANGING with our lives, but really, what does that even look like today? You'll also hear me reference one of the greatest men I ever knew that REALLY did something DEEPLY meaningful with his life on earth. I had the honor and privilege to see what real, destiny-altering legacy looked like for 48 years with my beloved husband and hero, Pastor Mayo. He was a LEGEND...to me, and to many of you.